Ai’m reddy fur teh dai naow! Doan’t wate fur me, kitteh! Ai aer nawt kwite reddee fur teh dai yet! 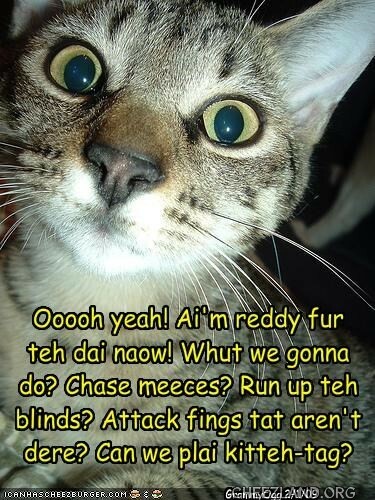 I usually nawt reddy fur teh dai until the “moarning” part am ober, rly…. indeed… *fetches sum icecream to cool teh fried brains* u want sum? *sets out a plate of assorted ice creams* njoy! A mawning kitteh meets a nawt-a-mawning hyoomin … iznut it awlwaiz teh way ?? I will need a lot more caffeen b4 I kin doing awl dat!!!! no wonder – you’re up urly!!! hoep it snot the nose bugging you?!? Deh kitteh bois luv tu git mii up b4 dawn. And then they take naps. In teh nise wawm bed tehy maed u git owt uv (at leest, tahts whut mai tu du) ! boi o boi dus taht sawnd liek awr hause-egg sept tahy due taht tew Mr. Casey & let mqos sleep-shoudn’t sniker…but…..
Well, kitteh, we gotz anuvver name-teh-kitteh game comin up later tuday, wif ansurs tu Toonasday’s (an also, wun moar, tumorro)… uvver tehn taht, anywun wif enerjee still aftur yesserday can still host own annibirfary stuffs if tehy wants tu, but I srsly duzzint know if ennywun DUZ has any enerjees left aftur yesserday’s awsumness!!!! It wuz awsum, wuzn’t it! Funny funny capshun, GrammyOgg! Lub it! Reedz kitteh’s spreshun purrzaklee. Naow dis foan nawt letting boop wen ai press teh Boop buttons, sew f y’all i, ai whirr krakkin awp wiffie alfamabits ob fings kittehs du tew waekin us awp – troo troo doze! GrammOgg, hao am yew btw? Awl settloed in yur noo digs? Wiining ober enneh conburts tew Cheezland ober dair?